I didn't like writing that headline an ounce more than you liked reading it. But viewers need to get angry, because Discovery's Shark Week is a travesty. On Monday, the channel began by airing a completely fake "documentary" called Megalodon: The Monster Shark That Lives. Drawing from the found footage genre, the film opens with supposedly real footage of a shark attack that none of the passengers survive. Savvy viewers will notice something is off from the first five minutes of the film. But Discovery, supposedly dedicated to educating viewers about the world, had no qualms passing this off as legitimate programming up to the minute of its airing. In fact, they still haven't fully acknowledged it was a fraud, opting instead for an evasive blink-and-miss-it disclaimer at the end of the show. Perhaps this could be forgiven as the worst marketing stunt in Discovery history. But the very next night, Shark Week presented Return of Jaws. Within the first minute, great white sharks are stereotyped as man-eating monsters who pose an existential threat to the people on Cape Cod, with one subject inadvertently echoing a line from Jaws: "We need a bigger boat." By minute two, the narrator warns: "They're coming right into the swimming beaches. The risk of an attack is rising." Rather than using valuable time to teach people about the importance of protecting these dying creatures, Discovery is cynically playing off cultural fears to make a buck, portraying sharks with a level or realism akin to Sharknado. There may be educational material mixed in, but the image being promoted is inexcusable. What Discovery could tell viewers is that a person dies of a shark attack in the U.S. at an average of once every two years. Sharks simply aren't a threat to humans at all, in any way. This is because humans are not a natural food source. Sharks do not hunt humans. The incredibly rare instances of sharks harming humans are accidental from misidentification. Humans, on the other hand, kill 11,000 sharks per hour. This means it would take 22,000 years for sharks to kill as many people in the U.S. as the number of sharks killed by humans in a single hour. These are magnificent creatures who are invaluable to the ecosystem and going extinct. And they're dying because people are slaughtering them. Contrary to popular belief, it's not just the great whites who are dying. One-third of shark species are currently endangered. Roughly 100 million sharks are killed per year intentionally for their fins. Additional sharks are caught by commercial fishing nets and habitat degradation caused exclusively by humans. Oceanic ecosystems operate on a very tight web, and the disappearance of sharks will have disastrous consequences. Most sharks are apex predators in the their environments. But they aren't indiscriminate carnivores. Sharks help keep their prey populations healthy by eating sick and dying members, which prevents the spread of disease to other animals. Their part in natural selection also helps to ensure that the strongest members of prey species do survive and procreate in a healthy manner. Scientists in recent years have discovered what they believe to be another benefit sharks provide to the ocean: ensuring the health of habitats through intimidation. 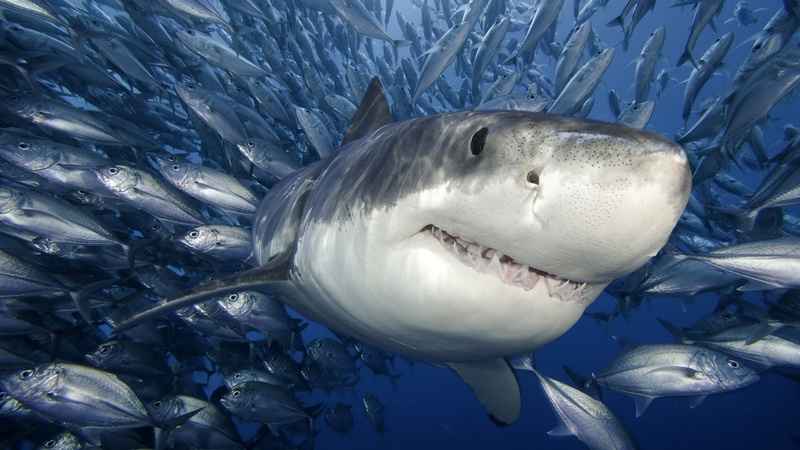 Prey species often tend to consolidate and overgraze naturally, but shark movements can keep these animals from remaining in one area to long and depleting their own food source. Sharks are considered a "keystone species" in the marine environment. What this means is that without these awesome creatures, the ocean cannot function properly. And if we don't stop killing them, they could become extinct within our lifetimes. Humans have a responsibility to fix the damage caused to the ocean. One important way to help is through working to save these dying animals. We could also boycott Shark Week until Discovery decides to stop scaring and start educating people about sharks. To learn more about how you can help save sharks, visit the Pew Charitable Trusts' Global Shark Conservation campaign.